Practice meet w/my trainer to get numbers for November's meet. Missed the first try at 405, never came off the floor. Trainer said, "You're done" and I said, "no, I think I've got it." We talked a bit and he said, "oh, you gave up? Well then yeah, try again." The gym was in an uproar, it was a grinder but I locked it out. The 405 is 4 plates, a major milestone on my road to a 5 plate deadlift. Awesome dude, those are great numbers! Especially the pull. I've never been able to master the deadlift, so when someone is able to post squats and benches like mine and then just demolish my pull I look at them in awe. Keep it up. KenDowns wrote: Practice meet w/my trainer to get numbers for November's meet. We are about on the same page. Look forward to testing my maxes again in the next few weeks. Time to boost this thread. Squat: 295 for three singles. That beats 1RM of 285 about 4 weeks ago. I hit a few lately. Remember this is coming from a bodybuilder. I did 3/8ths of a ton (750lbs) on the angled leg press 4 reps. That's 1.5 tons lifted in total. neutral grip chins 6 reps at a bodyweight of 220. I maxed out the new standing calf machine at my gym a few weeks ago. It goes to 340. I usually get 10 or 11, but one time I got 12.
barbell shrugs with wrist wraps, I got 4 at 405, 8 at 365, 11 at 315. Puts me in the 300 club! You know its time for a week off when you hit 2 PR's in two weeks and you don't care. Rack pull (from below the knee, never done them): 185kg (410lbs) x1 = over 2xbw! I haven't posted in awhile either, but have some new bests! Squat: 320x1 +5lbs from last test. Thought I could do 325, but doubted myself so I didn't try. DL: 425x1 +15lbs from last test. 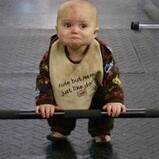 Tried pulling 430 and couldn't get past my quads. Chins: 5x4 Plus 1 each set since last tried a 2 weeks ago. Will probably hit my 5x5 goal by year end. Thanks. I want to work up to 3 reps each hand and then try for 120 lbs.